Microwave cream cheese spread in medium microwaveable bowl on HIGH 15 sec. ; stir. Whisk in eggs. Cook franks in large nonstick skillet on medium heat 4 to 5 min. or until heated through, stirring frequently. Add cream cheese mixture; cook 2 min. or until eggs begin to set, stirring occasionally. Stir in half the shredded cheese. 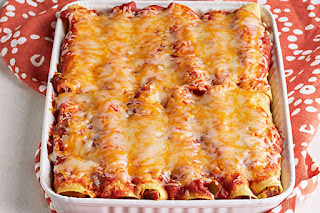 Mix salsa and tomato sauce until blended; spread 1 cup onto bottom of 13x9-inch baking dish sprayed with cooking spray. Spoon about 1/3 cup egg mixture down center of each tortilla; roll up. 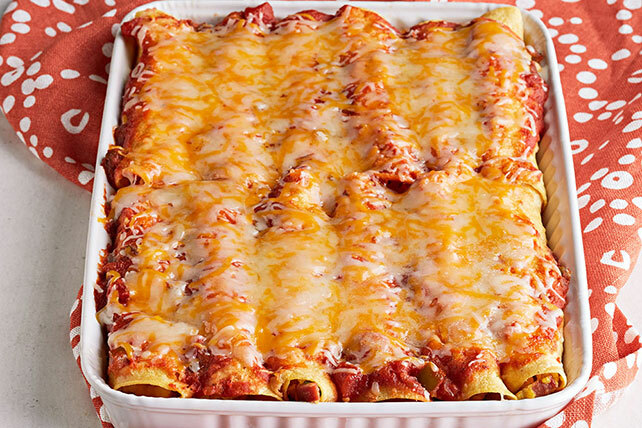 Place, seam sides down, over sauce in in dish; top with remaining sauce and shredded cheese.